Modernizing Medicine's Healthcare IT Suite offers a suite of products and services. EMA is a specialty-specific EHR for dermatology, ophthalmology, orthopedics, otolaryngology, gastroenterology, urology, plastic surgery, rheumatology and pain medicine. Work for Modernizing Medicine's Healthcare IT Suite? Learning about Modernizing Medicine's Healthcare IT Suite? "Intuitive program with minimal glitches"
Occasionally patients will replicate on their own (duplicate patients) despite archiving attempts. Additionally, I noticed an issue when uploading attachments to EMA in bulk vs uploading attachments while in the patient's chart. When managing attachments in bulk (prior to assigning them to the respective patient's charts), the recently uploaded files will default to the original versions if the file names are the same. Example: a file uploaded as 'Jane Doe path' will revert back to the original version in the patient's chart if there is a duplicate file name. 'Jane Doe path' uploaded on 9/5/15 will revert back to the first attachment with that file name (i.e. the version of 'Jane Doe path' uploaded on 3/17/15). A way to avoid this problem is by uploading the attachments directly into the patient's charts vs in bulk; this prevents duplicate file names through an automatic file renaming process (i.e. 'Jane Doe path' uploaded on 9/5/15 will automatically rename itself to 'Jane Doe path 1' to distinguish itself from the original file with the same name created on a previous date). This program makes it possible for both patients and providers to access and review clinical notes, test results, and billing information all in one place. Super convenient! "Great EHR system for a busy dermatology practice"
Each user gets a personalized experience based on there most used choices. It’s user friendly and easy to learn how to navigate. I don’t like the reminder system. I use this to keep track of my melanoma patients. The reminders don’t actually remind you without having to go in and look for a reminder. I would also love an option to save fax receipts. The actual fax saves to the patients chart upon sending, unfortunately there is no proof to show the fax went through without going through extra steps to find the fax receipt. Use the sandbox as much as possible before going live. Pay extra for “grand rounds” it’s very useful when you are treating a hard case patient. Grand rounds shows statistics based on what other providers have prescribed and how well it worked for them. It allows our office to run more smoothly and efficiently. It’s personalized to fit my needs and continues to update and become better. "EMA is user friendly, has an organized interface, and helpful tech support. " EMA is one of the more user friendly EHR systems that I have used. I also like that you can access grand rounds and that there is pre generated counseling included that you can alter to your liking. I also like that I can access it from outside the office. There are periods of time where there seem to be outages, but I have noticed that these are less frequent. I also would like to see features to help remind providers when monitoring is due for patients on high risk medications. I like that EMA helps with MIPS. The organization of the EHR makes it straightforward and easy to document. The integration and the communication with another software is always seamless it helps the process in getting the patient charts. Insurance input is also easy to follow and its great that it communicates so well with third party providers like pharmacies. It is great that the intramail system lets you communicate within your office. It makes it more discreet and quick to communicate within the clinic. When the sync system is down, does take a long time for it to get back up to date and all the information made on one software does not update. It is also a bit inconvenient when it does not show who made the changes before you. EMA is compatible with many software and for the most part quite seamless and it is easy for patient's to login and check their chart at their convenience. All in all this software is very effective. The system software is very secure I like how if I step away from my computer, there is a timer that will log your session out to preserve confidentiality. I also found that having a patient portal is very convenient and has given us a chance to be up to date with what is available in the market for medical software. What I like best about EMA is the simplicity and functionality of the electronic health record system. The iPad functions and touch physical exam capabilities are great. There were numerous times where an update would be pushed without previous information and the system would be down for minutes to hours which completely disrupts the clinic day. Easily scrollable information and recap improves clinic visit time and patient satisfaction. Also the integration of camera pictures to body placement is crucial in ease of treatment. "Making patients record handling easier day by day"
I like that it is easily accessible on my ipad--that is definitely the number 1 feature. Additionally, billing is seemless. I no longer have to look through a long list of codes, it automatically bills based on my notes. You can be much more efficient in your charting. It is cloud-based and template free. I find that being buried in the ipad sometimes can make you less effective with patients. Additionally, there is no way to order prescriptions without putting in an office visit. It takes time to integrate with your other software. Definitely schedule a demo so you can try it--like any other software. Be patient and give yourself time to learn the software. Ordering prescriptions, saving the drugs you've just prescribed, ordering testing, everything is easier, and can easily be viewed by other physicians in your practice. There are pre-populated fields for counseling patients, so you don't have to add as much. You can add findings and quickly access past findings. Thank you for taking the time to post a review! We wanted to be sure to address your concern regarding prescriptions. It is possible to order prescriptions outside of a visit. If you login to EMA Central, you will find helpful documents to help guide you through the process. For additional questions, please contact Support at support@modmed.com. "Very functional and thorough "
I love EMA EHR for dermatology, I like it’s ease on iPads and computers. It’s very thorough and exact for determining sites on the body. Perfect for taking photos. You can save presets and it’s great for scribing. It autopopulates everything you need with extra spaces to free type. As a nurse I love it. There’s a little bit of a learning curve if you’re not used to EHR software, but once you get the hang of it you almost can’t live without it. Excellent to store all your patients medical records in one place. Easy to access. "My Experience with Modernizing medicine "
It provides a great way of providing and storing electronic health records in a organized fashion. "Balanced work and patient life experience "
The system is convenient to interact with patients through the IPad while documenting health information. The system is expensive and requires multiple clicks or steps just to complete one task. The system shows better pictures and diagrams of the body to better diagnose patients and very detailed information. Also, the system does the coding based on the visits which are time-saving. It is very easy to use and it makes everything so simple. It benefits businesses by being very simple and easy to use. We greatly appreciate you taking the time to share your feedback and glad you have had a positive experience using our software! 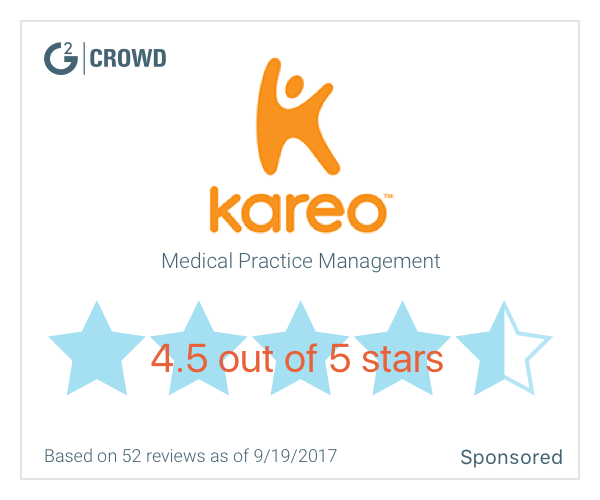 * We monitor all Modernizing Medicine's Healthcare IT Suite reviews to prevent fraudulent reviews and keep review quality high. We do not post reviews by company employees or direct competitors. Validated reviews require the user to submit a screenshot of the product containing their user ID, in order to verify a user is an actual user of the product. Hi there! Are you looking to implement a solution like Modernizing Medicine's Healthcare IT Suite?